The Torah portion of Terumah tells how the Jewish people were commanded to erect the Tabernacle, the Mishkan, so that G-d may “dwell among them.” It also tells how the Jews went about fulfilling this command by donating the necessary items. One opinion1 is that both the command to build the Mishkan and the Jews’ donations occurred soon after the Torah was given, and prior to the sin of the Golden Calf. Thus, it is understood that although the construction of the Mishkan and the bringing of donations had to have happened in accordance with only one of these three schedules, all three opinions are true as they relate to the spiritual Mishkan within the heart of every Jew. In what regard are they all true? Following G-d’s giving of the Torah, and before the sin of the Golden Calf, the Jewish people were on the level of tzaddikim , the truly righteous. Then they committed the sin of the Golden Calf. When they were forgiven on Yom Kippur, they attained the level of ba’alei teshuvah , penitents. Herein lies the difference between the abovementioned opinions: According to the opinion that the command to build the Mishkan and the giving of donations occurred soon after the giving of the Torah and prior to the sin of the Golden Calf, the Mishkan was constructed by tzaddikim. According to the opinion that the command to construct the Mishkan came on Yom Kippur , its erection was the work of penitents. According to the opinion that the sin of the Golden Calf took place between the time of the command to make the Mishkan and its actual construction, even the wicked — those who sinned with the Golden Calf — were able to participate in the construction of a Sanctuary for G-d. The lesson is as follows: A Jew on the lofty plane of a tzaddik may mistakenly think that having attained so high a level he should involve himself with purely spiritual matters, and that making a physical dwelling place for G-d should be left to those still struggling with the corporeal world. Herein comes the lesson of the first opinion: The command to construct the Sanctuary was given to tzaddikim. Since the tzaddik still exists within this physical world, failing to elevate the mundane by transforming it into a Mishkan can lead to a spiritual downfall. We may think that this manner of service applies only to a tzaddik , who never had to confront and vanquish evil. The penitent, however, has achieved this victory, and may think that he need not occupy himself any longer with physical service. We therefore have the second opinion, which informs us that the command to construct the Sanctuary was given to penitents. Then we have the third opinion: It teaches us that repentance is not a prerequisite to doing good deeds. Even something as sacred as a Sanctuary for G-d may be built by sinners who have not yet repented. Begin doing good at once, secure in the knowledge that repentance will surely follow! Based on Likkutei Sichos Vol. VI, pp. 153-156. Our Sages comment6 that the Torah is referring here to three different offerings: The first reference is to the offering used in constructing the sockets for the Mishkan ’s beams; the second refers to the donation of silver half-shekels for the purchase of communal offerings; the third refers to general offerings for the construction of the Mishkan. Of these three, only the last is described here in detail; the first two are only hinted at, and are described at length in later portions.7 Since all three Terumah offerings were for the sake of the Mishkan , why were they not all described here in detail? Since the transformation of the world into a Mishkan is connected to the building of the physical Mishkan , it can be understood that these three pillars played a part in the construction of the Mishkan as well. Torah is the root and foundation of all spiritual service. Every level and manner of serving G-d through mitzvos and good deeds is rooted in and based upon Torah, for every aspect of Judaism has its foundation and beginning in Torah. In the construction of the Mishkan , Torah is alluded to by the Terumah for sockets, since they served as the underpinnings of the entire structure, just as Torah serves as the underpinning of all Judaism. The general Terumah for the Mishkan , which included gold, silver, copper, etc., corresponds to the service of mitzvos — all of which are known by the term “deeds of kindness”12 — for they are performed with physical objects similar to those used in constructing the Mishkan. This third manner of service — “deeds of kindness” — possesses a quality lacking in the first two. Torah and prayer relate to an individual’s spiritual occupation with himself. Consequently, they are only able to affect the individual; uniting a person with G-d’s wisdom. “Deeds of kindness” — the service of mitzvos — however, requires one to be involved with physical matter. Here a person is able to transform physical things — by using them in the performance of mitzvos — into holy objects. It is specifically through man’s transforming of the world into a Mishkan that the Divine intent of creation is fulfilled, for “G-d earnestly desired a dwelling place in the nethermost level,”13 i.e., this lowly physical world.14 But in order for this manner of service to be proper and complete, man must also possess the attributes of Torah and prayer. Since all aspects of spiritual service are reflected in the Mishkan , the Torah portion details only the general Terumah — man’s service of mitzvos — for that is the ultimate intent. Based on Likkutei Sichos Vol. XVI, pp. 292-297. 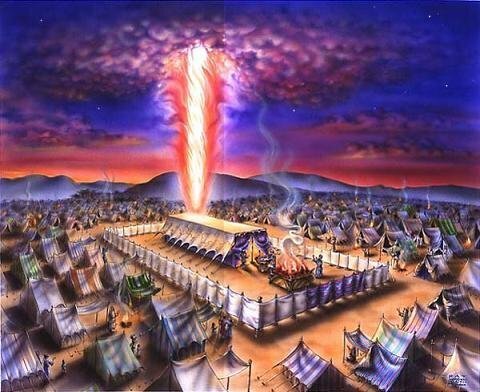 According to the Ramban , the main reason for G-d’s desiring a Mishkan was to have a place for the indwelling of the Divine Presence.18 This was accomplished by placing the “Testimony” within an Ark that had upon it the Kapores and the Keruvim. Thus, according to Rashi the Aron with its “Testimony” denoted the Torah, while the Kapores and the Keruvim , serving as the place where G-d made His will known, emphasized G-d’s love for the Jewish people. It thus follows that according to the Ramban , who maintains that the Kapores and Keruvim were one with the Aron , the phrase “I shall make Myself known to you… and speak to you from above the Kapores between the Keruvim ” relates entirely to the Torah, while according to Rashi the Aron related to Torah while the Kapores and Keruvim related to G-d’s love for the Jews. The reason for this difference between Ramban and Rashi is as follows: Ramban speaks in a revealed manner about esoteric matters of Torah. His commentary therefore deals with things as they are seen to exist. In this state, “Jews are bound to Torah and Torah is bound to G-d”27 — only through Torah can the Jewish people be bound to G-d. Accordingly, Rashi states that the Keruvim , which indicated G-d’s love for the Jewish people, were in the shape of infants, for the essential love of a father for his child is not dependent on anything; it stems from the simple fact that father and child are one. And it was this love that was revealed by the shape of the Keruvim. Based on Likkutei Sichos Vol. XXVI, pp. 175-181. 2. Tanchuma, Terumah 8. See also commentary of Rashi, Shmos 31:18, 33:11. 3. Zohar II 195a; Ramban beginning of Torah portion of Vayakhel. 4. Eruvin 13b and places cited there. 7. The first Terumah in Pekudei , 38:25ff; the second Terumah in Sisa, 30:13ff. 10. Commentary of Rashi and Bartenura et al , Avos ibid. 11. Berachos 26b; See also commentary of Rabbeinu Yonah to Avos ibid. 12. Likkutei Torah, Re’eh 23c. 13. Tanya ch. 36, based on Tanchuma, Naso 16. 16. See Rashi ibid. verse 21. 17. See commentary of Ramban on verses ibid. 19. See commentary of Rashi ibid. verse 16. 20. Ibid. verse 22 and see commentary of Rashi. 21. Commentary of Ramban ibid. verse 22. 22. Rashi ibid. verse 18. 23. Ramban ibid. verse 21. 26. Shmos Rabbah 34:2. See also Rabbeinu Bachya and Abarbanel on the verse ibid. 27. See Zohar III 73a. 28. See Likkutei Dibburim III, 491b. 29. Bereishis Rabbah 1:4; Tanna d’Vei Eliyahu Rabbah ch. 14. See also Likkutei Torah, Shir HaShirim 19:b-c; Hemshech 5666 , ma’amar titled Vayidabeir… b’Midbar Sinai.